What is your Favorite 2013 YA Book? Each January when the Printz award and the Best Books List are announced, Illinois Teen Librarians are surprised, elated or shocked. Now is your chance to vote for your best book by participating in the YASF 2013 YA tournament of books this March. In this tournament, 16 titles will be placed in brackets with the winner from each bracket moving on to the next. Librarian judges will decide which book will win by writing a review on the blog with the reasoning for their decision. At the January 30th meeting, forum members will select the titles and the judges. 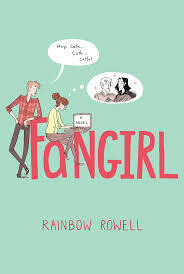 My 2013 favorites, Eleanor & Park and Fangirl,appear on both adult and teen 2013 best book lists. It is really amazing that two books by one author are on the best lists in one year. Belittled by her classmates for her red hair and “big body,” Eleanor lives in a stepdad situation. Eleanor shares a room with her four siblings, her stepdad is abusive and there is little privacy or money. At school she is subjected to numerous pranks by the popular group. A geek and somewhat of a free spirit, Park is a son of an American father and a Korean mother. His loving parents are kind and his family serves as a contrast to Eleanor’s horrible home setting. Due to the cursing of some characters and the abusive character of the stepdad, this book was challenged in Minnesota during Banned Books Week in September. It is an honest view into how poverty, bullying and abusiveness can erode the human spirit but not destroy it. Despite Eleanor’s scary home life the story is not depressing and shows how love conquers all. So far Fangirl is on Library Journal’s best 2013 YA Lit for Adults and also the 2013 Best Young Adult Fiction List. It is a coming of age story about fanfiction and also features a first love theme. Main character Cath writes Simon Snow fanfiction which resembles the Harry Potter character. When both Cath and her twin sister go to college, writing fanfiction continues to consume Cath while her sister Wren relishes the social scene. The relationship between the sisters and their father is the heart of the novel. 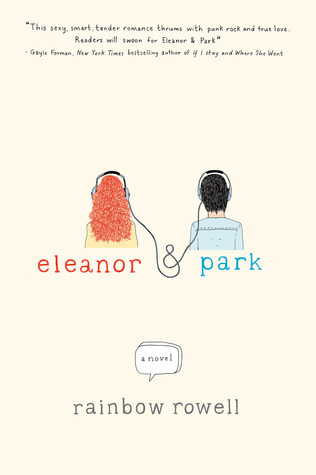 The characters, the college setting and the plot have a lighter atmosphere than Eleanor & Park. There is a strong emphasis on how Cath develops as a writer with the help of her college friends. What are your favorite 2013 titles? Join in the fun of the Young Adult Services Forum Tournament of Books and participate as a judge or submit titles by sending an e-mail to mmiller@nileslibrary.org before January 30, 2014. Do you know a young adult librarian doing something innovative, creative, or just extra fabulous? Or maybe you’re the one doing those fearless things? 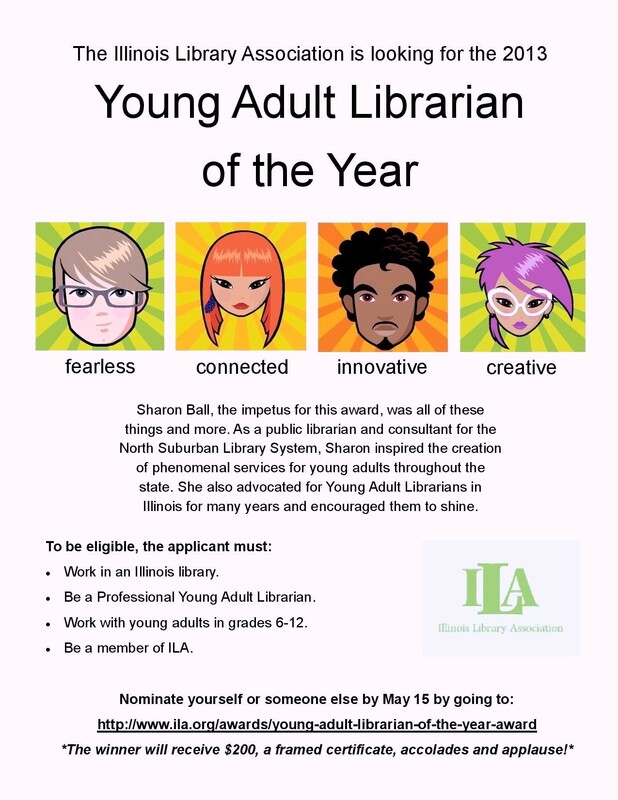 The deadline to nominate someone (including yourself) for ILA’s Young Adult Librarian of the Year is May 15th. Please visit this link to find out more information, and please consider nominating someone today. Did anyone predict that one? I listened to the live stream of the ALA award ceremony earlier, and I have to say I was pretty surprised when they announced Nick Lake’s In Darkness as the winner. It’s gotten fabulous reviews, but it wasn’t on my Mock Printz list, and – I’m ashamed to say- it’s still on my “to read” pile. I was predicting a win for Code Name Verity by Wein, Dodger by Pratchett or My Book of Life by Angel by Leavitt. Of course, it’s now on the top of my pile. There was also some buzz about TFiOS (John Green) not getting any Printz recognition. For some reason, however, I wasn’t surprised about that one. So, what do you think – was it as big of a surprise as last year? 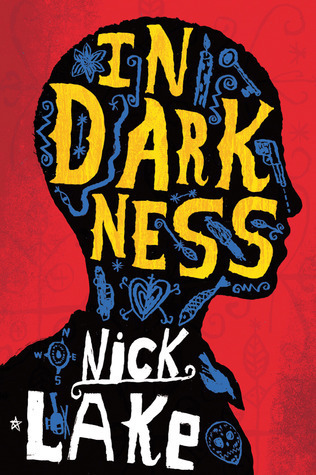 “In Darkness,” written by Nick Lake , is the 2013 Printz Award winner. The book is published by Bloomsbury Books for Young Readers. Four Printz Honor Books also were named: “Aristotle and Dante Discover the Secrets of the Universe” by Benjamin Alire Saenz , published by Simon & Schuster Books for Young Readers, an imprint of Simon & Schuster Children’s Publishing Division; “Code Name Verity” by Elizabeth Wein , published by Hyperion, an imprint of Disney Book Group; “Dodger” by Terry Pratchett , published by HarperCollins Children’s Books, a division of HarperCollins Publishers; “The White Bicycle” by Beverley Brenna , published by Red Deer Press . The teen (ages 13-18) award winner is “Somebody, Please Tell Me Who I Am,” written by Harry Mazer and Peter Lerangis and published by Simon & Schuster Books for Young Readers, an imprint of Simon & Schuster Children’s Publishing Division. “Caring is Creepy,” by David Zimmerman , published by Soho Press, Inc.
“Pure,” by Julianna Baggott , published by Grand Central Publishing, a division of Hachette Book Group, Inc.
“Tell the Wolves I’m Home,” by Carol Rifka Brunt , published by Dial Press, an imprint of the Random House Publishing Group, a division of Random House, Inc.
“Where’d You Go, Bernadette?,” by Maria Semple , published by Little, Brown and Company, a division of Hachette Book Group, Inc.
“The Fault in Our Stars,” produced by Brilliance Audio, is the 2013 Odyssey Award winner. The book is written by John Greenand narrated by Kate Rudd. Three Odyssey Honor Audiobooks also were selected: “Artemis Fowl: The Last Guardian,” produced by Listening Library, written by Eoin Colfer and narrated by Nathaniel Parker ; “Ghost Knight,” produced by Listening Library, written by Cornelia Funke and narrated by Elliot Hill ; and “Monstrous Beauty,” produced by Macmillian Audio, written by Elizabeth Fama and narrated by Katherine Kellgren . “Aristotle and Dante Discover the Secrets of the Universe,” written by Benjamin Alire Saenz and published by Simon & Schuster Books for Young Readers, an imprint of Simon & Schuster Children’s Publishing Division, is the Stonewall Award winner. Four Stonewall Honor Books were selected: “Drama,” written and illustrated by Raina Telgemeier and published by Graphix, an imprint of Scholastic Inc.; “Gone, Gone, Gone,” written by Hannah Moskowitz and published by Simon Pulse , an imprint of Simon & Schuster Children’s Publishing Division; “October Mourning: A Song for Matthew Shepard ,” written by Leslea Newmanand published by Candlewick Press; and “Sparks: The Epic, Completely True Blue, (Almost) Holy Quest of Debbie,” written byS. J. Adams and published by Flux, an imprint of Llewellyn Worldwide Ltd.
“Seraphina,” written by Rachel Hartman , is the 2013 Morris Award winner. The book is published by Random House Children’s Books, a division of Random House, Inc.
Four other books were finalists for the award: “Wonder Show,” written by Hannah Barnaby , published by Houghton Mifflin, an imprint of Houghton Mifflin Harcourt Books for Young Readers; “Love and Other Perishable Items,” written by Laura Buzo , published by Alfred A. Knopf , an imprint of Random House Children’s Books, a division of Random House, Inc.; “After the Snow,” written by S. D. Crockett , published by Feiwel and Friends, an imprint of Macmillan Children’s Publishing Group; and “The Miseducation of Cameron Post ,” written by emily m. danforth, published by Balzer + Bray, an imprint of HarperCollins Publishers. “Bomb: The Race to Build—and Steal—the World’s Most Dangerous Weapon,” written by Steve Sheinkin , is the 2013 Excellence winner. The book is published by Flash Point/Roaring Brook Press, an imprint of Macmillan Children’s Publishing Group. Four other books were finalists for the award: ” Steve Jobs : The Man Who Thought Different,” written by Karen Blumenthal , published by Feiwel & Friends, an imprint of Macmillan Children’s Publishing Group; “Moonbird: A Year on the Wind with the Great Survivor B95,” written by Phillip Hoose , published by Farrar Straus Giroux , an imprint of Macmillan Children’s Publishing Group; “Titanic: Voices from the Disaster,” written by Deborah Hopkinson , published by Scholastic Press, an imprint of Scholastic; and “We’ve Got a Job: The 1963 Birmingham Children’s March,” written by Cynthia Levinson , published by Peachtree Publishers. Recognized worldwide for the high quality they represent, ALA awards guide parents, educators, librarians and others in selecting the best materials for youth. Selected by judging committees of librarians and other children’s literature experts, the awards encourage original and creative work. For more information on the ALA youth media awards and notables, please visitwww.ala.org/yma . Awards season is fast approaching! The Newbery, The Printz, the Oscars, and joining those auspicious ranks comes the Illinois Library Association’s Young Adult Librarian of the Year Award! You have not heard of this award? Well, that is not surprising as this year is the inaugural year. This is the very first time you can honor a Young Adult Librarian with an award from the Illinois Library Association. Don’t miss this opportunity to show your appreciation for the dedicated Young Adult Librarian in your life! All you need to nominate someone is letters of reference and a one-page summary about why you think the person you are nominating deserves this award. Award recipients will receive a $200 financial award and a certificate.